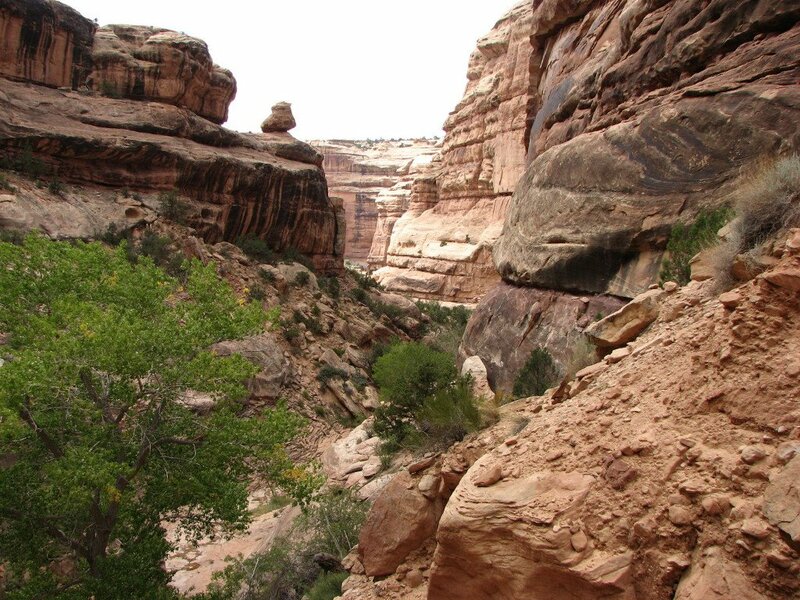 Sheiks Canyon is a short and steep side canyon that enters Grand Gulch between Todie and Bullet Canyons. Sheiks Canyon is not shown or described in the Cedar Mesa Travel Guide that the BLM provides to visitors. However, it's a fairly well used access to Grand Gulch. It also provides day hikers with access to the well-known Green Mask rock art panel. I do not recommend Sheiks Canyon for beginning canyon country hikers. The trail is steep and in places very hard to follow. Parts of this hike require good route finding skills and, if you are in the canyon bottom in the wrong place, it is a laborious hike/scramble through dense brush and piles of house sized boulders. These ruins are perched on a ledge just above the canyon floor. 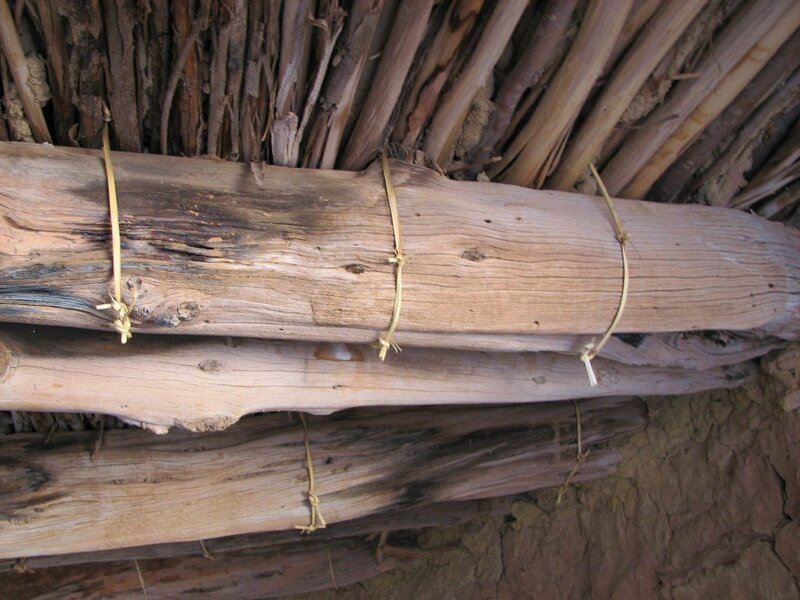 In particular, their roofs are very well preserved. The Sheiks Canyon trailhead is fairly easy to access. The access road is west of Utah 261 at just about mile marker 24.2. The road is signed and is County Road 250. It is a pretty good road in dry conditions and suitable for any type of vehicle, although low clearance vehicles will have to park about � mile before the car park. After turning onto the road drive a bit more than 4.5 miles to the parking area where there is room for several vehicles. I have never camped here but there are camping opportunities available. This close-up of the ceiling of one of the rooms shown above. The construction techniques are easy to see. narrows and drops fairly steeply. The trail through this section mostly goes straight down the slickrock bottom and it's not too difficult to find the side trails detouring around the rough places. Along this part of the trail keep your eyes peeled as you will find ruins on a ledge just above the canyon bottom. One set of two structures is very well preserved and the roofs in particular are in great shape. The middle section of Sheiks Canyon is broad, fairly flat and easy hiking but then it narrows down again and from here the hiking gets pretty challenging. First comes a series of small pour-overs that are passable by staying straight through on the slickrock bottom. Soon, there is a pour-over that's 3 to 4 feet high across the entire canyon bottom. The way to get through is at the very left-hand edge looking down canyon. It is easy and scramble down, as it's only about a 3 foot step down. You come down behind a couple of giant boulders - one leaning against the other and you go through a short little tunnel formed by the rocks. At this point you have to immediately cross the creek on the slickrock and start heading up the slope on the right-hand side. This room is tucked onto a really cool rock formation. The ruin is a short distance down the canyon from the previous two. There are some cairns marking this trail but it takes some route finding to figure it out. The trail climbs up and out of the creek bottom and you can look down in the creek at various places along the way. Looking down at the canyon bottom makes you thankful to be above the mess. The canyon bottom itself is littered with house-size boulders interspaced with jumbled rock piles and thick vegetation. It would be a torturous effort to hike down the canyon bottom. The trail skirts along this inner gorge of the canyon which is descending rather rapidly. This is a skinny little trail and you have to pay attention. Continue to follow along this side slope until you reach an obvious saddle and stay in the canyon you are in.Continue to head down canyon for a short distance until there is no more skinny little trail and the only option is to go straight down a pretty ugly slope of loose conglomerate rock. This slope has disintegrated badly and it is a steep trail. There is no actual trail - you figure out your own way to get down it. It's very steep and it's soft and loose. If you are day hiking, one of the worst parts about going down this slope is realizing the return trip requires a climb back up this same slope. This view of the lower section of Sheiks Canyon shows the steep, narrow canyon that you have to navigate. This view is from above the canyon floor near the point where you need to climb steeply down into the canyon bottom. Hikers are far better off finding this trail than trying to make it through the canyon bottom. The slope ends in the slickrock canyon bottom right where the jumble of rock fall choking the streambed ends. Hiking the slickrock bottom you quickly reach a broad sandy area where vegetation starts to spring up as you approach the intersection with Grand Gulch. Green Mask Spring and the Green Mask rock art panel are located a couple hundred yards before Sheiks Canyon joins Grand Gulch. Sheiks Canyon is a good hike for experienced hikers. It?s a quick way to get into Grand Gulch and is not used nearly as much as the nearby canyons. 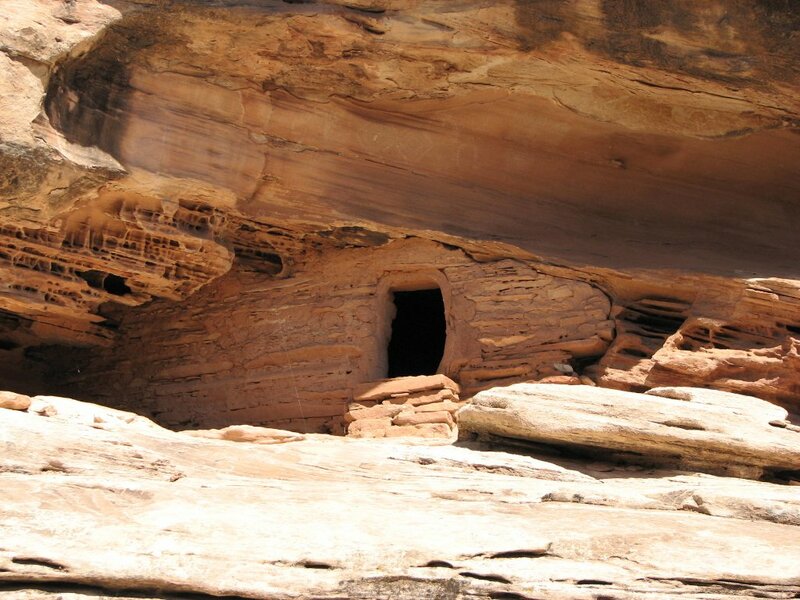 A good description of Sheiks Canyon can be found in A Hiking Guide To Cedar Mesa by Peter Tassoni. However, I believe that the trail advice in Beard's book above is more accurate. I find it to be best suited for day trips into Grand Gulch for backpacking, I prefer to use other accesses. 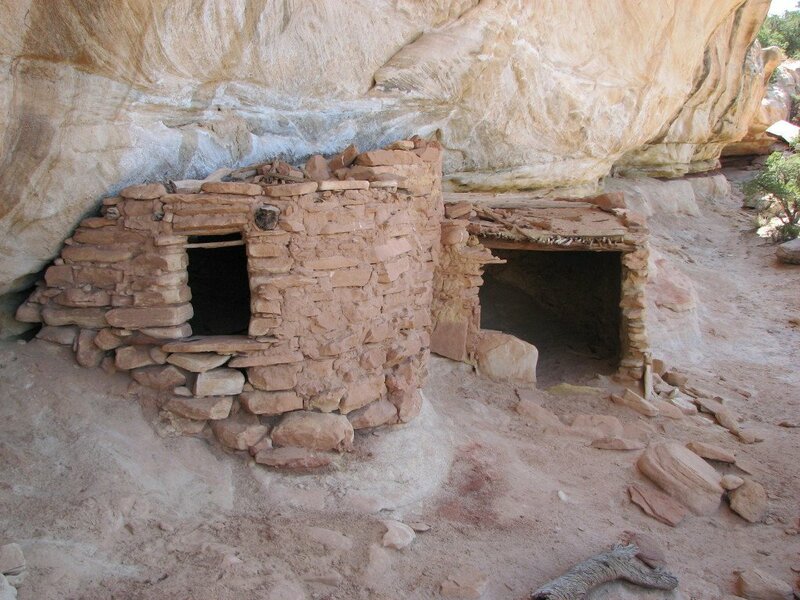 While there are other hikes I would recommend before this on Cedar Mesa, it offers the experienced hiker and interesting option.